Happy new year to every one of my readers out there -- have a good one! Another thing that makes it almost sad going back home this year is the increased sales tax: Since today, Germans have to pay 19% on almost all their sales, instead of 16% before. Another interesting one is that from now on, buying cigarettes at German cigarette vending machines is only possible with debit cards that carry the age information of the holder, so underage smokers can't easily buy cigarettes anymore. Do you know anything else that has changed (in these two countries or whatever one else...) and is noteworthy? Feel free to leave a comment! There are a write app as well as a spreadsheet tool which, if they want it to be successful, will surely have to try hard competing with Google's recently "hyped" Docs & Spreadsheets. However in addition to that they also have a presentation tool (ajaxPresents) that -- judging from my first impression -- looks and feels pretty much like the big standalone applications, Powerpoint and OpenOffice. It can also export and import these two file formats, which makes it a brilliant tool to edit presentation slides on a computer where you happen not to have an office suite installed. But there are even two more on the list: A drawing tool called ajaxSketch (conveniently exportable to SVG) and an online MP3 player called ajaxTunes (if I see it right, it's Flash, not AJAX, but ah well). All in all this seems to be a very interesting company to keep an eye on; and I would not be surprised if they made it on the list of Google acquisitions some time soon -- just like Upstartle, the company which produced the tool Writely, now part of the aforementioned Google Docs & Spreadsheets. These two issues made Google Code hosting -- while being a nice, new thing -- overall inferior to the well-established services of sourceforge. And while Google made clear they didn't "want to hurt SourceForge", an important decision a young Open Source project faces when it starts is where to put the code and what is best for the project. Not having any website or possibility to download a precompiled package is not one of the best things for projects, for sure. 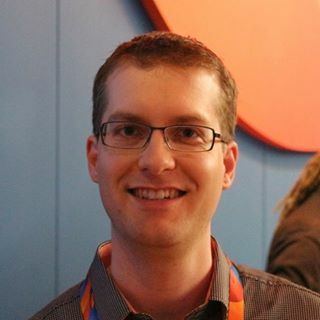 With the new features, Google Code has become a real alternative to SourceForge and I imagine in the time to come, Google's code hosting will steadily grow and get more projects that did not go there before for lack of these features. A nice thing to mention about the Google Code hosting Wiki is that it apparently keeps its version history in SVN. So going back in time when checking out the source tree will also give you the Wiki status at that point in time. Very neat, if you ask me. Adding downloads, however, sounds to me like a no-brainer and I am confused why they didn't have this feature from the beginning. Allegedly, project owners helped themselves by just uploading the release files to the SVN source tree and pointing their download links directly to the HTTP interface of the SVN server. Not too surprising -- and that can put quite some load on a repository server. This "feature" is therefore not so much a new invention as it is closing a hole that shouldn't have been there in the first place. In any case I am eager to see how the open source community (and sourceforge) react. 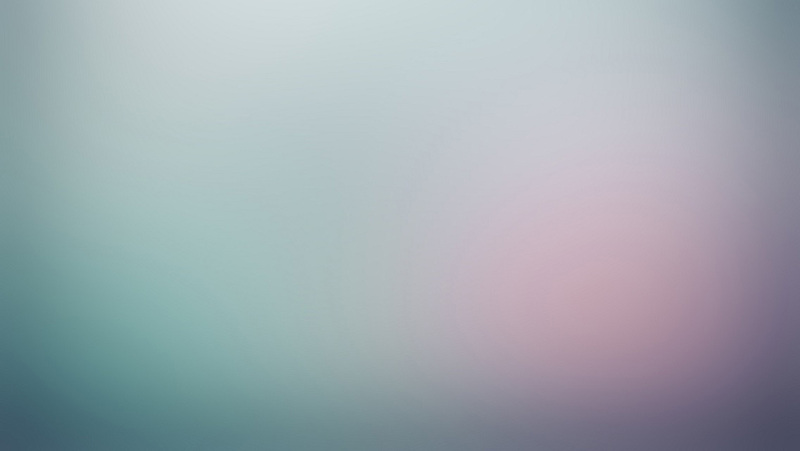 A very neat and nice way to create rounded corners without spending too much time with the Gimp or so. (That's probably why Google did it in the first place). A mirror effect like this one used by Apple in iTunes (underneath the actual photo). As far as I know for Mac OSX programmers there is an API that does that and therefore this effect is extensively used in some OSX applications. That would indeed come in quite handy at times and I imagine it would look quite nice in people's blogs. Another idea would be the auto-generation of drop shadows for images. 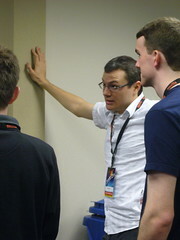 At last month's Firefox Summit, everybody got a nice name tag on a lanyard to carry around their neck. That was extremely useful, especially since people frequently put their real name as well as their IRC nick on there. Yesterday I had to debug a Mac OSX program and therefore I had to learn about how Mac Universal Binaries work. Universal Binaries contain (most of the time) PowerPC code and Intel x86 code as well. While they could easily also feature code for other architectures, like your toaster or microwave, it usually looks somewhat like this: [Header|PowerPC|Intel]. The operating system decides which code it needs and executes the part of the file suitable for its architecture. Now in order to see what kind of binary information is "sandwiched" in the file, there is a header, very nicely described in the Mac OS X ABI Mach-O File Format Reference. It starts off with a "magical number", that funnily reads 0xCAFEBABE in hexadecimal. -- Cafe babe? Yup. For a more in-depth explanation of how universal binaries look like, I recommend this blog post. Zooomr, a "web 2.0" website for photos, is in my opinion the most promising flickr competitor around. 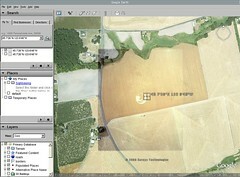 It shares a lot of features with its well-known big brother that was bought by yahoo a while ago. My first impression of Zooomr is that it works very flawlessly and is by all means worth a thought when you decide where to host your photos. While I have set up an instance of Gallery 2 for my own photos, I always had the problem that I needed to scale them down to, say, 800x600 pixels. Otherwise every single photo would eat up around 2 megabytes-or-so of my personal web space, eventually filling up space needed for the actual websites etc. Also, modern photo sharing sites come with a lot of nice features like RSS feeds, tags etc. ; through their photo sharing capabilities, they are much easier to integrate into blogs or other web applications than classic photo tools. Therefore I will give zooomr a shot for a while now, and eventually I will decide if I want to put all my photos on there or not. A big part of my decision will obviously be how much they want to charge me after the free year. Flickr takes 25 Dollars per year which, while it is not a lot, has kept me from signing up there so far, because I was unsure if I would use it enough to justify the (long-term) investment. 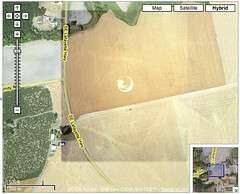 Firefox Crop Circle hits Google Earth and Maps! Very nice! 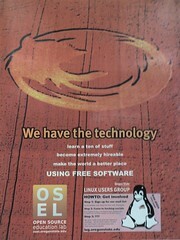 And well done, dear friends from the OSU Linux User Group! Today, I am mo-blogging from Oregon State University, while I am here for work and "turkey week" reasons. Yesterday I had an interesting conversation about the meaning(lessness) of several software project names, such as the well-known PHP, Wine and others, but also smaller projects like OSUOSL's RAIV. As it turns out, every fancy project name is also an acronym. That's something that got really popular among Open Source projects, and even though some people argue it is kind of lame, it is nice to see how many more or less meaningful project names and acronyms have come up over time. But there are also projects that are missing a "useful" solution for their "acronymic" name: I recently learned about the project called Oink. Oink is a collection of C++ static analysis tools and comes with a pretty awesome, still not-yet-"acronymed" name.